Yang Xiaoyun, a dog lover from Tianjin, once again created a stir on her arrival in Yulin, the host city of the annual dog meat festival in Guangxi Zhuang Autonomous Region. Many dog sellers surrounded the 65-year-old woman, scrambling to peddle their dogs to her. During the last festival, Yang, a retired teacher who runs an animal shelter in Tianjin, paid 150,000 yuan ($24,000) for nearly 360 dogs and dozens of cats and saved them from being slaughtered. Since then, she has become famous in Yulin, and many vendors called her ahead of the festival to sell her their animals. 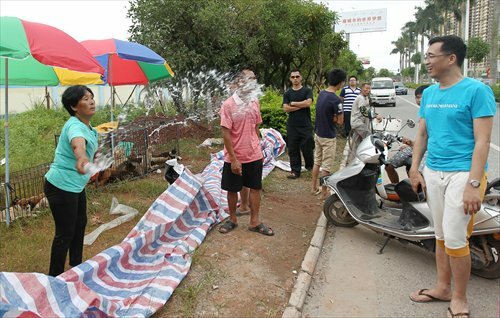 This year, due to wide opposition to the festival, the customers in Yulin have become fewer and business has declined. Many dog vendors think selling their dogs to Yang is a good option. Yang also changed her strategy. She chose to pay by weight, instead of by the dog. 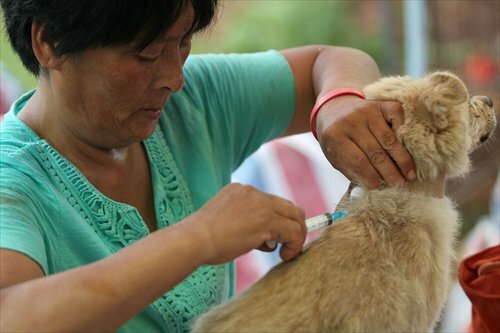 On June 20, she spent 7,000 yuan for about 30 dogs and 70 cats. She has also realized that setting up banners and holding demonstrations to stop eating dog meat are not effective methods. "I want to spread people's love to dogs by building dog shelters and opening vegetarian restaurants here," Yang said. 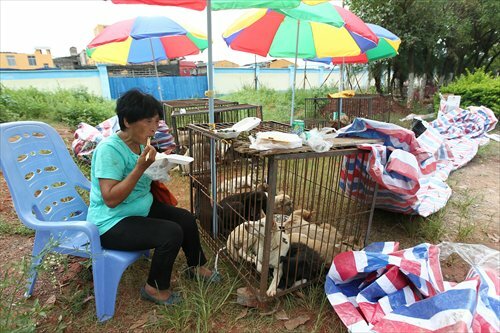 However, her plan to build a foster home for dogs in Yulin was rejected by local authorities, and she set up a temporary shelter alongside a remote road. Next she will transport the animals back to Tianjin. Since 1995 when her husband passed away, Yang started to adopt homeless dogs. So far, she has raised more than 3,000 dogs in her shelter. To collect money, she sold the house that had been designated for her son to live in after he married. She always appears at major dog rescue activities. Many volunteers support her with donations. But her efforts have also met with controversy. Some animal welfare activists worry that the purchase of the dogs at high prices would encourage some people to make profit by stealing and selling dogs to her. Yang has become more and more vital to the adopted dogs. "The dogs can't live without me. As long as I am alive, I will take good care of them," she said. She has also made arrangements for after her death. Her insistence on animal welfare finally touched the heart of her son, who at first firmly opposed what she was doing. Now her son and daughter-in-law are both involved in raising her dogs. Yang trusts that her son will be her successor and care for the dogs until their last days, and continue her mission of rescuing more dogs.